The Hong Kong Polytechnic University (PolyU) men’s team snatched the championship of the “PolyU・King’s Flair Group Asian Universities Invitational Basketball Tournament” following a heated finale fight. The Hong Kong Polytechnic University (PolyU) men’s team snatched the championship of the “PolyU・King’s Flair Group Asian Universities Invitational Basketball Tournament” following a heated finale fight. The Tournament, with eight strong basketball teams from Asian universities competing in Hong Kong, is an event for celebrating the PolyU 80th anniversary. It also aims at fostering connection among Asian universities, as well as promoting basketball and sportsmanship. After a series of exciting matches in the preliminary round, from 13 to 15 June, the final matches were staged on 17 June. In the third place match, Al-Farabi Kazakh National University defeated Nanyang Technological University by 97:53. The finale fought between PolyU and Taiwan University of Science and Technology turned out to be a breathtaking match, with PolyU eventually snatched the championship by 92:74. The other teams in the Tournament are from: Kyoto University, South China University of Technology, Universiti Brunei Darussalam and University of Macau. 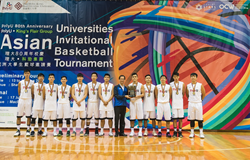 PolyU men’s basketball team has been in top-notch standing in recent years, having snatched the championship at the Hong Kong Inter-Collegiate Basketball Competition for four years in a row. Seven of its members will be representing Hong Kong in the World University Games held in Taipei in August this year while another 18 PolyU sportsmen will compete in other events in the same occasion. At the Tournament’s prize presentation ceremony, PolyU President Professor Timothy W. Tong and Deputy President and Provost Professor Philip C. H. Chan presented the trophies to the top four teams. The winning teams were also presented cheques of scholarships by Mr Kendrick Wong, representative of King’s Flair Development Limited, the title sponsor of the Tournament. The champion team PolyU received HK$50,000, and Taiwan University of Science and Technology, the 1st runner up, HK$30,000. Al-Farabi Kazakh National University and Nanyang Technological University, which got the 3rd and 4th places, received HK$20,000 HK$10,000 respectively. Dr the Hon. Lam Tai Fai, PolyU Council Deputy Chairman, presented the individual awards of Points Leader, 3-Points Leader, Assists Leader, Steals Leader, Rebounds Leader, and Most Valuable Player to seven players. Besides providing a competition and exchange opportunity for the sportsmen of the eight Asian universities, the Tournament also provided opportunities for students from different places to learn more about different cultures. Moreover, it also helped PolyU further promote the benefits of doing exercises to all in campus. PolyU has been active in promoting sports development in campus. Through the Outstanding Sportsmen Recommendation Scheme, 600 students have been admitted into PolyU over the past 19 years. PolyU also provides various sports and recreational activities to students for enhancing their physical and psychological wellness, so as to empower their academic and whole-person developments.